This morning my junior clients continued into their fourth hour of Basic Muay Thai for Martial Arts Cross Training. 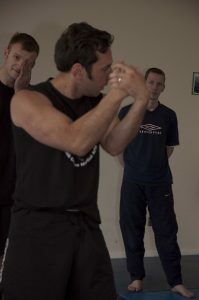 This lesson introduced the clinch and we also continued work on kick-catching. We warmed up with mobility exercises, dynamic stretching and specific callisthenics before we moved through basic punch, kick and knee combinations. This led us onto kick-catching and the importance of breaking an opponent’s postures. We covered both the cross-arm check from a round kick into a catch and catching the teep. Understanding how to unbalance an opponent and then timing it with your own strike is a fundamental aspect of Muay Thai and it informed our clinch training. The clinch began with the plum position. We covered entering into the clinch correctly, controlling the inside and using good footwork. From here we looked at how to manipulate an opponent’s movement in order to break their posture and balance using the neck holds and changing foot positioning/stance switching. Once this was confirmed we incorporated knee strikes and how to make use of range to get maximum acceleration into the spear knee. Finally we looked at legal Muay Thai sweeps and how to set these up. These were then integrated with the rest of clinch work already covered.